Recreational vehicles have been with us for a long time. It’s a mature industry that has seen its share of cycles; boom and bust. Right now the RV industry is in a tremendous growth cycle and it is pushing a new and significant trend across the commercial transport and shipping landscape. But don’t think it’s just Grandma and Grandpa spending their pensions on one last shot of freedom. For those of us pushing past 50 the stereotype of Bill and Barbara driving the Winnebago down to Clearwater from Indianapolis after Christmas is forever etched in our minds; especially having spent so much time behind them heading south into Chattanooga. Chances are the folks you see rolling out of a shiny new Sprinter conversion to fuel up or kicking the tires on a spiffy new Airstream at the rest stop are decidedly NOT Bill in Barb; more like Justin and Jessica. Along with hundreds of thousands of other millennials shedding house-filling materialism for experiences on the open road. Justin and Jessica don’t have a ton of coin, but they are spending a bunch of it on a little slice of heaven they can haul to whatever amazing destination they have in mind. Combine that new-found popularity with the a similar bent pushing retiring baby-boomers out the door to accomplish a pale-full of bucket-list adventures, and you got yourself a real and relatively sustainable trend. It wasn’t all too long ago that the industry was on life support, but the depth of demand and the potential to attract new young buyers for a lifetime is giving the RV industry new hope the trend is sustainable. According to Forbes’, Dale Buss RV sales have risen by 15% or more, and for the first time ever broke a half-million in sales in 2017. The stocks of the Bigs, that is, Thor (#1), Forest River (#2) and Winnebago (#3) have all seen new heights and have attracted big investors including ‘Ol whathisface at Berkshire Hathaway. Buss reports that RV companies have recently opened 15 new facilities in Northern Indiana, the industry’s “Headquarters” according to Forbes. Hugelmeyer’s comments followed the release of the annual “2018 North American Camping Report,” an independent study commissioned by Kampgrounds of America Inc. (KOA). The study found more than 6 million new North American households adopted the camping lifestyle since 2014. Hugelmeyer finds the outdoor industry’s overall strength is bolstered by the the fact that the Department of Commerce’s Bureau of Economic Analysis (BEA) report included the outdoor recreation industry in its calculations for the first time. BEA’s report issued in February, found outdoor recreation accounted for 2% ($373.7 billion) of current-dollar GDP in 2016, with the outdoor recreation economy growing 3.8% in 2016, well ahead the 2.8% GDP growth accomplished by the economy overall. SGB Executive says the report shows RVs are playing a significant role in US economic growth. “Motorized Vehicles,” the largest activity within “Conventional Outdoor Recreation” in 2016, accounted for $59.4 billion of gross output. Of the $30 billion in direct economic activity in 2016, RVs accounted for more than half of that. Global Industry Analysts Inc. note that the global market for recreational vehicles will cross some 770,000 units by 2022 with the majority sold in the US. Although many will be motorized and self-propelled, the vast majority of RVs on the road are tow-able. The list includes travel trailers (single pull, haul & tow, tractor trailer loads), fifth-wheel travel trailers, gooseneck trailers, utility trailers and let’s not forget hauling the boats and cars for the coming wave of experience-led adventuring either. RV hauling likely growing faster than others. Recreation Vehicle Industry Association’s (RVIA) March 2018 survey of manufacturers found RV wholesale shipments finished at 51,607, an increase of 8.5% from the 47,579 units shipped last March. The March 2018 shipment total is the best March on comparable record, and first time monthly production has surpassed 50,000 units. All towable RVs, led by conventional travel trailers, says the RV Industry Association, totaled 45,490 units for the month, an increase of 8.9% compared to last years’s towable RV shipment total of 41,766. March motorhome shipments ended the month with 6,117 shipments to retailers, up 5.2% compared to last March’s total of 5,813. For now, things are looking quite robust: Year-to-date wholesale shipments, says the Association, are currently at 137,086, up 13.4% compared to last year. Towable RVs are in double-digit territory up 14.4% to 119,593 units and Motorhome shipments were up 7.0% to 17,493 units. Clearly there is big business afoot and RV transporting specialists are popping up everywhere, some very new to the industry, given the lower capital and equipment expenses buying or leasing a decent pick-up truck to get started. Similarly, non CDL drives are inviting themselves to the party as well. Recently the FMCSA announced its decision to grant an exemption from the Federal commercial driver's license (CDL) requirements for drivers who deliver certain newly manufactured motorhomes and recreational vehicles (RVs) to dealers or trade shows before retail sale (driveaway operations). Because compliance with the CDL requirements prevents its members from implementing more efficient operations due to a shortage of CDL drivers, RVIA requested the exemption. The exemption covers employees of all U.S. driveaway companies, RV manufacturers, and RV dealers transporting RVs between manufacturing sites and dealer locations and for movements prior to first retail sale. There are inherent risks to this strategy and fleet operators as well as owner operators are going to have to get pretty serious about managing it operationally and financially if they are to succeed. 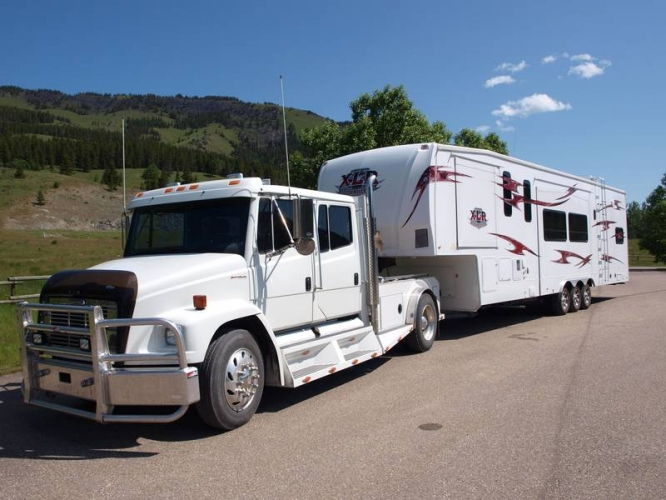 Although RV units that have a combined gross vehicle weight exceeding 26,000 pounds are not covered by the exemption, drivers engaged in driveaway deliveries of RVs with GVW ratings of 26,001 pounds or more will not be required to have a CDL as long as the empty RVs have GVWs or gross combination weights that do not meet or exceed 26,001 pounds, including any RV trailers towed by other vehicles weigh 10,000 pounds or less. It’s a whole new world for some, and well-worn territory for others, but the fact remains RV transportation is one of the hottest, fastest growing segments in the shipping industry and the challenge for the industry will be to get all those RVs to all those millennials, especially Justin and Jessica, safely and in time for the annual trip out west with the kids.